Maxime Bernier is hoping his new People’s Party will usher in a conservative revolution in Canada. For years, Bernier has been championing the cause of smaller government, lower taxes and reduced immigration — but now the Quebec MP who finished a close second to Andrew Scheer in the last Conservative Party leadership race thinks these ideas can win the next Canadian election. Maxime Bernier is hoping his new People's Party will usher in a conservative revolution in Canada. For years, Bernier has been championing the cause of smaller government, lower taxes and reduced immigration — but now the Quebec MP who finished a close second to Andrew Scheer in the last Conservative Party leadership race thinks these ideas can win the next Canadian election. 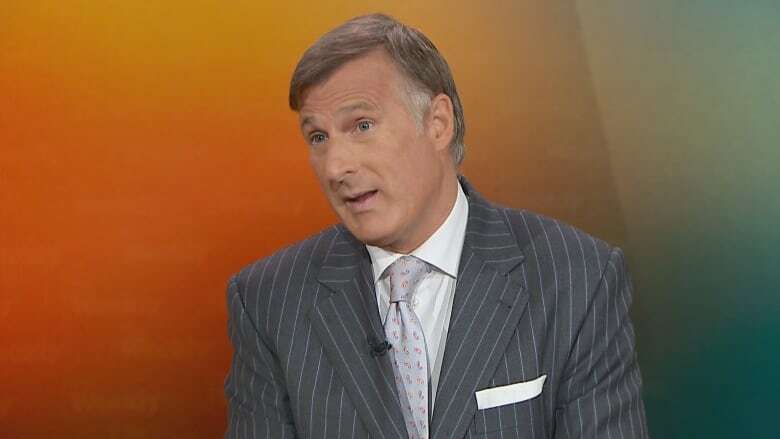 A recent Nanos survey found that 17 per cent of Canadians would be open to supporting Bernier's new party, something he credits to his principled policies. Atlas lists the Montreal Economic Institute and Canada's Fraser Institute among its partners. Bernier served as a VP at the MEF before entering politics and one of his two lieutenants at his new party, Martin Masse, also worked there. Bernier's other lieutenant, Maxime Hupe, was until recently at the Fraser Institute. Both Atlas and Fraser have received large donations from the Koch brothers. Bernier sat down with Wendy Mesley on CBC's The Weekly to discuss his ideology and how he'll grow and fund his fledgling party. Wendy Mesley: And joining me now is Maxine Bernier. Welcome. Maxime Bernier: Thank you very much. I'm very pleased to be with you. MB: No, no, I'm not connected to that. I'm raising money for the party ... and I'm able to raise money from the grassroots. I don't have any link with the international organization. I'm doing politics in Canada based on freedom ideas and that can be the only link. So, less government, more efficient government ... Our policies are based on four principles — individual freedom, personal responsibility, respect and fairness. And I think that's what people like. MB: Absolutely, absolutely, and I'm proud of that. You know, I'm a free market politician and I think I'm the only one who worked for think-tanks like the Montreal Economic Institute. And yes, I learned a lot over there and that's why I'm promoting free market policies. That's what I believe. I think we must have more competition. When you have more competition, you have better products and lower prices. WM: Would you not want their help, either the Koch brothers or the Atlas Network's help now? They've helped you in the past. You're going to need a lot of help. You're trying to run 338 candidates in the next election. You have no machine compared to what [Conservative Leader] Andrew Scheer has. Or Justin Trudeau. MB: Yeah, you're right that I don't have [a] machine. I'm building a party right now. The Montreal Economic Institute cannot help me to build a party and have riding associations all across the country. MB: But I'm not a think-tank. I left the Montreal Economic [Institute] 13 years ago. So I'm a political party ... we build that party and we are raising money using the legislation in Canada. So a Canadian citizen, only a Canadian citizen, can donate to our party and every political party with a maximum of $1,500. So we're following these rules and we are able to raise money. When I'm sending an email, we're going to raise a lot of money by $5, $10, $20, from the grassroots, from ordinary Canadians that want a change in Canada. MB: I will add that it's easy to raise money when you're saying what you believe to Canadians, and where you are an authentic politician. Yes, you're right. People want that. So when you're saying what you believe in, they know that, and when they like your ideas ... I want a smaller government, yes, but I want a government that will be fair. I want to get rid of corporate welfare. MB: No, I didn't say ... that I wanted to be the Ron Paul. I really admire Ron Paul because he's an authentic politician. WM: But what about what he stands for? MB: Yeah, but he's an authentic politician. WM: That's it? That's all you need to be, is authentic? MB: You need to be authentic, and believe in something. You know the Conservative Party of Canada — I'm not part of that party anymore, as you know, because they don't have any ideas. They're doing polling and they're going to say what the population wants to hear. For me it's important to have a real discussion about equalization. You know the equalization formula, it's unfair for Western Canadians, it's unfair for other provinces also. We must have a discussion about that, about universal health care delivery of services from private delivery or public delivery. We need to have this discussion in Canada. I want to have this discussion. So Ron Paul was an authentic politician because he said what he believed. Same thing for me. That's a good relationship between me and Ron Paul, I think. WM: But you saw what happened to ... Ron Paul had all of these ideas that you espouse as well. But the Tea Party sort of got hijacked by a lot of people with bigoted points of view. Are you afraid of that? MB: No, no. Because, you know, the advantage that I have, I'm building a party based on the program that I [fought] for and put forward during the leadership campaign for the Conservative Party of Canada a year ago. So people who want to be part of that party must share our program. If they don't share our program, they're not welcome. And they just have to create their own party. WM: You got a lot of criticism for your comments about extreme multiculturalism, kicked off quite a debate. It has become a bit of a dog whistle for people with bigoted points of view. And I know that you have spoken out about how you don't want these people in your party. You're trying to get them off your social media. But I do wonder if you've noticed that Rebel Media, for example, does seem to be fond of you. It's been accused, of course, of being supportive of white supremacist views and they're supporting you. So Ezra Levant, they have a million subscribers on YouTube and 150,000 followers on Facebook. Do you want his support? Do you want his audience? MB: ... and if I received it I would think about it. You know, I want to reach Canadians who believe in our ideas and use all the platforms available to do that. I'm using social media, I'm using Facebook, I'm using Twitter. It's all the same ideas. And I want to have the opportunity to reach more Canadians. You know, we're at 10 per cent in the polls right now, a new party. My goal is to grow that and to be the alternative for the Trudeau government. WM: So you have a year before the election. Will you be ready? MB: For sure I will. WM: What will you do if the Koch brothers call you? MB: I don't know why you are asking that question. WM: Well, because they have funded groups that have been very influential in giving jobs to people who are now forming the crux of your party, and you. MB: We are a political party and we are raising money following Canadian legislation. That's it. And if a Canadian can donate, they can go to my website right now. Please go on my website right now, maximebernier.com. That's my own website, People's Party of Canada, and they can give money [up to] the maximum $1,500. So that's what we're doing. It's a grassroots movement. And I'm having money from the grassroots, not from big corporations. WM: How long until you register the party? MB: Couple of weeks from now. WM: Lovely to talk to you. Thank you. MB: Thank you. I appreciate it. Watch The Weekly with Wendy Mesley, Sundays at 11 a.m. on CBC Television [11 a.m. ET on CBC News Network].